It is of common knowledge that Christianity came into India, as early as the 5 AD. What is unique about this region of India i.e the region of Bombay, Salsette,& Thana, is that these have had the unique priviledge of being preached to by two Jesus Apostles, St. Bartholomew and St. Thomas. From there on the religion came down generations untill the time of the Portuguese, where the East Indians were baptised as "Roman Catholics". For details with regards to this please read the Related Links and History. And thus the East Indians are one of the rare and unique Roman Catholic people, whose belief in the faith predates Roman Catholism. There are various aspects wherein the East Indian customs have amalgamated with religion. During Lent, the Passo service is followed with much fervor, despite of various priests of various parishes not supporting this. On Good Friday, over the last few years, there is a categorical announcement that the service is over and that "the lowering of the cross" is not a part of the liturgical service. Be it as it is, it is important to understand that the passo service all through lent, has kept the religion alive, through the depiction of the sorrows of Christ. It is believed that this has been carried on for centuries. During the last week of Lent, it used to be quite common to hear a group of male voices going from street to street singing the "Papya". One mad be able to hear this at a few areas which are dominated by East Indians. Due to Govt. Regulations and lack of support from the Church, this beautiful and extremely pious singing is steadily dying. The men singing the "Papya" usually cover their heads and hold candles whilst walking late at night. Their strong voices are easily carried, and those who hear it say a short prayer. After every stanza a wooden rattler is sounded, as no bells can be rung till Easter. To small children this sad hymn of only male voices, sounds quite frightening. The elders in the house normally do not encourage the children to go to see the procession of "Papya". Another famous East Indian culture with regards to Len is the singing of the "Puran". This concise depiction of the passion, death and rising of Our Lord Jesus Christ, written poetically in Marathi by Father Thomas Stephens(1549-1619), around the 16th Century. This Marathi Puran is written in English typography. The Marathi Puran is sung with no accompaning musical instruments. East Indians have a very strong faith in the Virgin Mary. 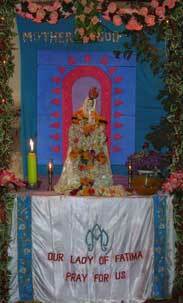 During the month of May, the entire village gather together to welcome Our Lady into their village. The villagers get the image of Our lady from the church with music, hymns and prayers. They take the entire route through the villages, touching upon the various wayside crosses that have been bordering the villages since hundreds of years. The whole night goes in prayers. The next day there is a mass in Marathi, after which the image is returned to the church, again with band music, hymns and prayers. Christmas is celebrated with much enjoyment. It is often that we see groups of young christians going door to door singing Carols, and spreading the joyous Spirit. Regardless of our origins and the "debate" on the fist evangelism and/or adoption of Jesus Christ in our hearts. We cannot forget those Christians who have had to go through a very difficult time, to freely profess their faith. Many of them have had to loose their lands, their livelihood, their promotions...etc, as they do not get the same privileges. Many of them have even martyred themselves at the hand of religious fanatics.